Centrally located at the corner of 5th Avenue and 28th Street, Ascott BGC caters primarily to international business travelers, expats and diplomats who are on a long-term assignment in this bustling financial and business district. Centrally located, the BGC area include some of the Fortune 500 companies such as UnitedHealth Group, Hewlett Packard, JP Morgan Chase, Citigroup, Wells Fargo and Morgan Stanley hold offices at BGC. The embassies of the United Kingdom, Singapore, Korea, Norway, UAE and Israel have also relocated their headquarters in the area. Across 5th Avenue is Bonifacio High Street housing a number of restaurant offering international cuisines, prepared by Manila's top chefs, served in a casual dining made extra special by the distinctly Filipino hospitality. Ascott Bonifacio Global City also caters to discriminate leisure travelers and staycationers who are looking not only for a place to sleep, but for spacious and elegant living spaces with enough room to move around and equipped with modern home-living amenities for that ultimate comfort and convenience that only a serviced residence such as Ascott BGC can offer. 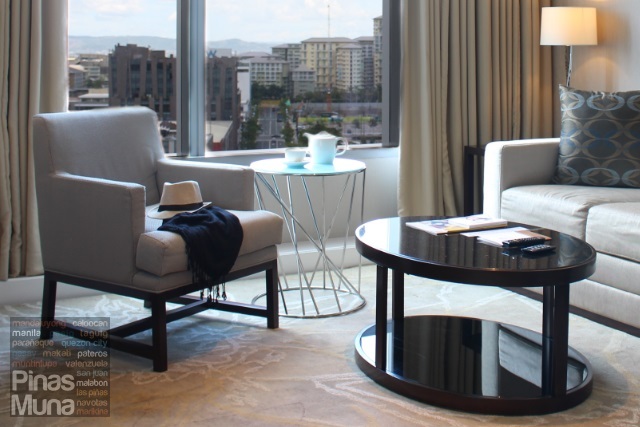 While most hotels focus on the bedroom, the living spaces are at the core of serviced residences because this is where families and friends gather together, interacting and socializing with each other, sharing fun conversations, cheerful laughter, and celebrate significant events in their lives. The living area of the one-bedroom suite where we stayed in is just perfect for those moments. It was spacious, well air-conditioned and is furnished with a set of comfortable sofa and couch. The ceiling to floor window allows natural light into the area and provides the guests with stunning view of the city. The home entertainment system includes an LCD TV with digital cable channels, a hifi system with Bluetooth connectivity capabilities, and a DVD player. Next to the living area is the dining area with a round dinner table that can seat four persons, perfect for intimate family dinners or entertaining a small group of friends. The interior has a contemporary design with earth tone colors that make the space warm and cozy. Adding a Filipino touch to the service are these cute jars containing local delicacies such as dried mangoes, shing-a-ling, banana chips, camote chips, polvoron and otap. What makes Ascott BGC perfect for staycations are the fully equipped kitchens inside all their rooms and suites. Our one-bedroom suite has a spacious marble-topped kitchen counter and a sink with excellent water pressure. A new sponge and dishwashing gel are also provided. A complete set of glassware, crockery, cutlery and utensils are stored inside the drawers. There's also an electric kettle should you wish to make tea or coffee. Some units have a Nespresso machine so if you are particular about your coffee, make sure you note it in your booking. While dining out is a more convenient option, cooking your own food is more economical option for families on staycation or extended stay. Cooking is also an opportunity for families or friends to bond together. For your grocery needs, there's Robinsons Selections at Forbestown and SM Supermarket at SM Aura Premier. A number of 24/7 convenience stores are also located near Ascott BGC. Some of the kitchen amenities include a cooker hob & hood, a microwave oven, a refrigerator and a washing machine with dryer which long-staying guests will definitely love. Rice cooker is also available upon request. 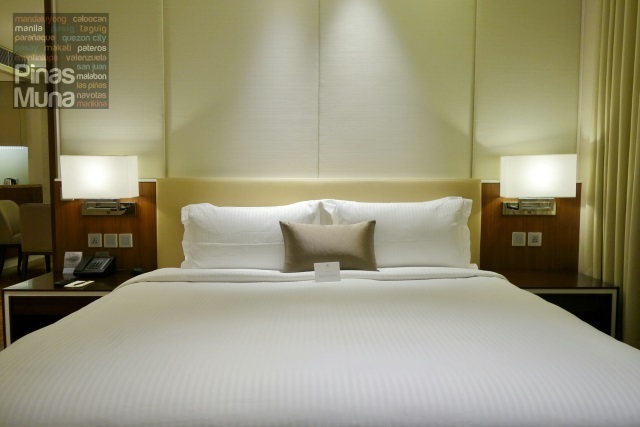 Equally spacious is the bedroom furnished with a king size bed topped with 500 thread-count linen. The mattress was very comfortable to the back, and thanks to the down feather pillows, we had a long, uninterrupted sleep and woke up the following day feeling well-rested and energized. Our bedroom also had an LCD TV with digital cable channels. Also facing the bed is a full-size executive writing desk where I spent some hours replying to emails and writing some articles using the fast WiFi Internet connection available inside our suite. We were impressed by the generous space inside our en suite bathroom. There's a separate walk-in shower from the bathtub. There's also an abundance of towels provided, from foot towels, to face towels, and to the bath towels, all are clean and smelling fresh. The walk-in shower has a rainshower head installed from the ceiling. 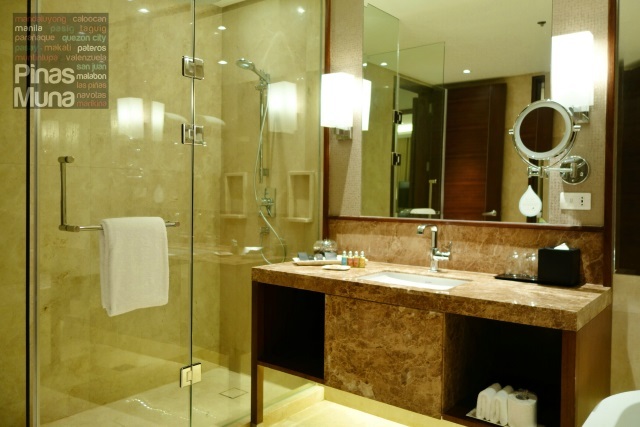 Hot and cold water flows from the hand shower and the rainshower. Water pressure was consistently strong anytime of the day. 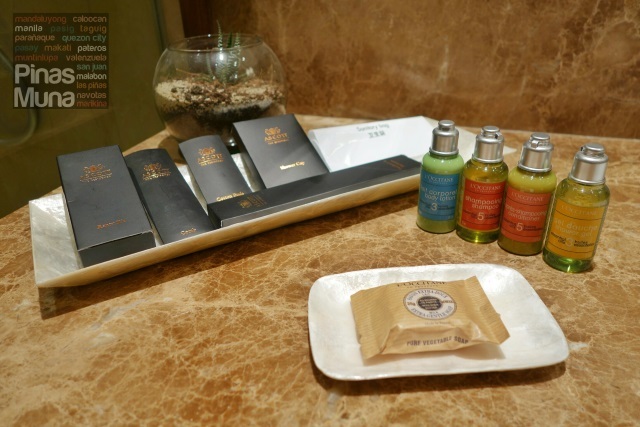 Adding more touch luxury to the bathroom are the L'Occitane en Provence branded toiletries, the same brand used in all Ascott properties around the world. After a quick shower, we called housekeeping to mop the floor of the bathroom. We didn't have to wait long, Kuya Roel was ringing our doorbell only a few minutes following our call. After mopping the bathroom floor, Kuya Roel also made our bed, looking crisp and wrinkle free. Good job, Kuya Roel! We had coffee inside our room and felt like having a morning swim before having breakfast. We first passed by the gym to check-out the facilities. Stepping in, it was like entering a high-end fitness center complete with top-notch workout equipment. A fitness trainer also attends to the guests who wish to use the gym. Next to the gym is a 25-meter outdoor swimming pool. After a few laps, we went for a quick dip in the heated Jacuzzi. Feeling soothed and relaxed, our tummies started to growl, as if telling us that it's breakfast time. Located on the second floor is Alta, the all-day dining restaurant of Ascott BGC. Alta is the first hotel-based restaurant venture of the Cibo Restaurant Group. Our overnight stay at Ascott BGC comes with buffet breakfast served at Alta. Buffet breakfast is also available to walk-in guests at P995.00++ per person. The restaurant is well air-conditioned with natural light coming in from the floor to ceiling glass windows, making the area feel airy and spacious. The buffet breakfast did not have an expansive spread, but is adequately complete. I had my usual croissants, Italian cold cuts and cheese while Edgar had rice, artisanal bacon and English bangers. We also had customized omelets, mine was a Spanish omelet while Edgar had ham & cheese omelet. We ended our breakfast with fresh fruits, chilled fruit juice and coffee. After breakfast, we spent the rest of the morning at the living area of our suite, listening to bossanova music, sipping on earl grey tea, and lazing around doing nothing but simply enjoying our stay. 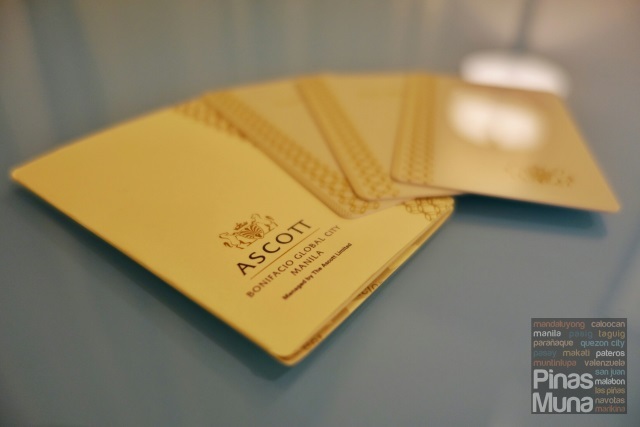 Overall, we loved our stay at Ascott Bonifacio Glocal City Manila. Being a serviced residence, staying at Ascott BGC is just like staying at home, leveled up by the luxurious and state-of-the-art amenities. The spacious living spaces, the fully equipped kitchens, and the tastefully designed interiors make Ascott BGC the perfect choice for business and leisure travelers, as well as staycationers. The use of this 360° virtual tour of Ascott BGC Manila in Taguig City is authorized by Traveloka.